Popular Hollywood movies were shown in New Zealand just a few weeks after their overseas release. This 1929 ad shows that an Auckland cinema showing Hollywood's latest hit musical . Like its big-city American counterparts it also provided continuous sessions and live entertainment. At the opening of Auckland’s huge Civic Theatre opened in December 1929 a crowd of thousands pushed inthe doors and staff were so busy that they threw handfuls of money into the box-office safe, unable to count it. Films were a feature of New Zealand social and cultural life from the earliest days of commercial cinema. Only ten months after the world’s first public cinema screening in December 1895, a motion picture was shown in Auckland, using an Edison projector imported from the United States. A decade later Aucklanders could see, a few months after its American release, the first 10, 000 foot long movie - America at Work. The next year the Queens cinema in Auckland adopted the American city custom of having continuous screenings, from 11:00 a.m to 11 p.m. By the end of 1916 that city had thirteen inner-city picture theatres. By the end of the 1920s, one sixth of the population of Auckland went to the movies each Saturday night. 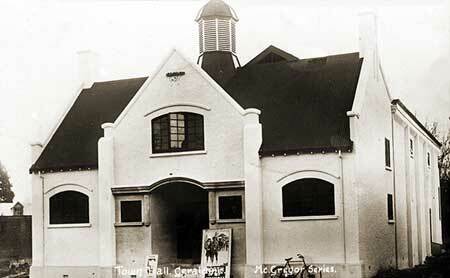 AS early as 1911 the small provincial centre of Nelson had motion pictures. 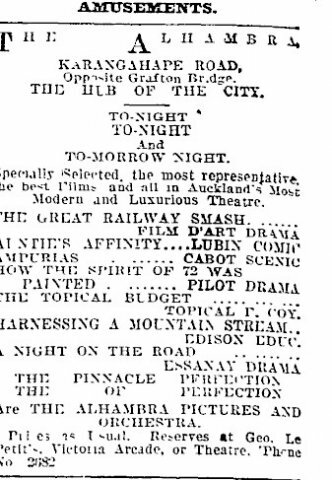 The programme for the Alhambra Cinema, June, 1914, Auckland . The popularity of movies with New Zealanders was cemented in 1929, with the arrival of sound. When the De Luxe theatre in the small Horowhenua town of Levin installed ‘talkie’ equipment, bus services were re-organised in order to take residents from even small neighbouring towns such as Shannon into Levin for matinees and evening sessions. And when Whakatane’s Grand Theatre showed Broadway Melody, so many travelled over rough roads from isolated settlements such as Te Puke that a special 11:30 p.m. session had to be held. By the 1920s foreign observers commented on New Zealanders' infatuation with the cinema -especially Hollywood movies. In 1929 the United States Commerce Department published a bulletin Motion Pictures in Australia and New Zealand. Its author, Eugene Way, noted that for New Zealanders – ‘well-educated, healthy, sports-loving’ – cinema-going was a popular activity. He observed that "90 per cent of the films shown in New Zealand were of American origin",noting that "programs are very similar to those seen in the United States. All the feature pictures are exhibited only a few weeks after their release on Broadway ... the picture fan frequently sees many American pictures before they have been made available to the smaller American communities....the average motion-picture house in New Zealand is a comfortable, luxurious building ... comparable with theaters in cities of similar sizes in the United States. Orchestral selections, organ solos and other features precede the showing of the film, and every care is taken to cater to the desire of the public." Way also claimed that New Zealander cinema audiences enjoyed the ‘adaptation of well-known novels, society drama and light comedies’, but disliked ‘morbid and melancholy tragedy films." This movie-mania had a mixed reception. In 1944 the periodical NZ Magazine observed disapprovingly, ‘[o]ur public is film-mad – Hollywood mad. Our public is so hungry for celluloid tales well presented – and Hollywood has the technique – that they will roll up afternoon and evening and cheerfully swallow the fare provided, without being too fussy about the details’"
"We New Zealanders are a nation of film fans. Only tea drinking is a more popular diversion with us than picture-going. We adopted the motion picture earlier and more enthusiastically than most other countries, and today we spend as much time and money at the pictures, per head of population, as any other people in the world, except the Americans –and even they are not very far ahead of us. It follows that our picture-going habit exerts an enormous influence upon our manners, customs, and fashions, our speech, our standards of taste, and our attitudes of mind. If there is any such thing as a ‘New Zealand culture’, it is to a large extent the creation of Hollywood." Movies provided the themes ofmany dances and balls in New Zealand between the wars. Sometimes they were for more affluent sections of society; more frequently in small town halls once the movie was over, seats would be moved, carpets rolled up and the dancing would begin. The small rural South Island town of Geraldine used its 'Town Hall' for showing movies. Poster shows the 1939 movie 'North Yukon'. When poet James K. Baxter wrote a lyrical account of his teaching life in the remote settlement of Akitio in the fifties, he depicted the local ‘cinema’ as the focus of the small community’s entertainment. Films were shown every second Saturday in the ‘landing shed’ ... a large barnlike structure near the beach on the property of a local farmer and used until the nineteen-forties for storing wool’. Go shivering, screened by rain? This primal sense of the audience participating in a communal experience can also be found in that most cinematic (and neglected) of New Zealand novelists, Ronald Hugh Morrieson. As Daniel Craig points out, Morrieson’s superb novel The Scarecrow utilises the serial conventions of 1950s Hollywood horror and noir films.26 It contains an affectionate description of the cinema of Klynham, the fictional stand-in for Hawera hometown of his childhood and adolescence in the interwar years. Special buses were needed to bring people from surrounding towns into the small Bay of Plenty town of Whakatane to see their first "talkie". Why was cinema, which essentially meant American cinema, so popular and so emotionally and culturally resonant in New Zealand for over half a century? The poet and essayist Peter Wells adopts a similar view. He believes that films possessed a ‘peculiar power over New Zealanders, partly because every one of us, regardless of race, is unavoidably shaped by distance.... cinema became our form of foreign travel’. Wells maintains that cinema was popular here because it offered New Zealanders a means of vicarious escape. Why would we want to see our own country? Didn’t it wait to ambush us the moment the lights went up, and the doors burst open and we ran out like an exploding packet of hundreds-and-thousands. Wasn’t this precisely why we were all huddled in the dark, at our votive stations? To escape the endless nausea of living in a small and distant island? To escape the prairie of asphalt, the stern ancestral eyes of our telegraph poles? Of course we didn’t want to see our own country. Wells believes that for midcentury New Zealanders, to watch a film was ‘in essence, to browse, to mope joyously through an eternal and shuffling catalogue of things we didn’t have’: vehicles, cars, modes of socialising, dressing and living. ‘We learnt how to be citizens of the world – clumsily, it must be admitted – through the dumbshow of cinema.’ He also believed that New Zealanders were attracted by the very technology of cinema. ‘In a country dominated by old automobiles, where anything technical could be mended and massaged so it might last, films had about them the very scent of technical invention: magic made visual’. Hollywood made the exotic and the wondrous available to Wellington and Whakatane alike, transported the sounds and images of overseas to rich and poor, all made equal in a darkness illuminated only by a translucent and flickering cone of light, providing a feast for the starved imagination. 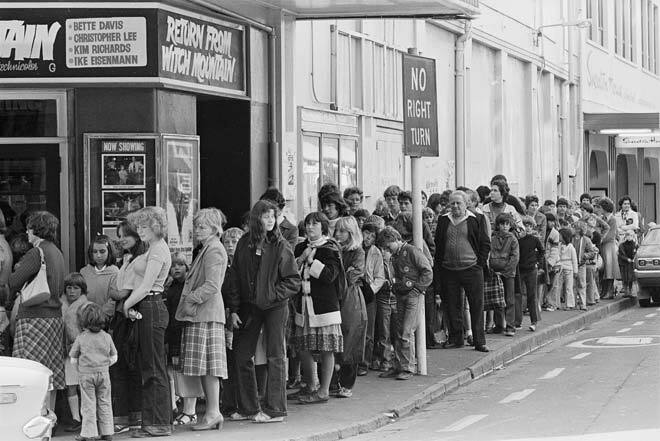 There were other reasons reasons why New Zealanders flocked to see movies. An officer who questioned a discussion group of 2nd NZEF personnel in 1944 on their attitudes to the ‘pictures’ concluded that ‘Servicemen and women make no bones about the motives behind picture attendance. These are either escapism or habit: “Why do I go to the movies? Because my girl-friend (substitute ‘wife’ where applicable) likes to go out on a Saturday night..... Apart from the younger candid souls who go in pursuit of “a bob’s worth in the dark”, and that select minority who scan the advertisements to find a programme that appeals to them, the bulk of servicemen go from habit or for want of something better to do... A majority in these groups agreed that they went to see films for relaxation and amusement, though there were a few who said they went for educational reasons...."
Whether the moviegoer was a rowdy schoolboy rolling jaffas down the aisle during a Saturday afternoon Tim Holt western, a teenage couple on their first date, or grandparents having a night out, going to ‘the pictures’ was a staple of New Zealand communal life for decades. Queing for a matinee session, Lido Cinema, Wellington, 1960.